Astronauts are involved in all aspects of assembly and on-orbit operations of the ISS. This includes extravehicular activities (EVA), robotics operations using the remote manipulator system, experiment operations, and onboard maintenance tasks. Astronauts are required to have a detailed knowledge of the ISS systems, as well as detailed knowledge of the operational characteristics, mission requirements and objectives, and supporting systems and equipment for each experiment on their assigned missions. Long-duration missions aboard the ISS generally last from 3 to 6 months. Training for long duration missions is very arduous and takes approximately 2 to 3 years. This training requires extensive travel, including long periods away in other countries training with our international partners. Travel to and from the ISS will be by Space Shuttle until its retirement in 2010. Following the Shuttle retirement, all trips to and from the ISS will be aboard the Russian Soyuz vehicle. Consequently, astronauts must meet the Soyuz size requirements, as indicated below. 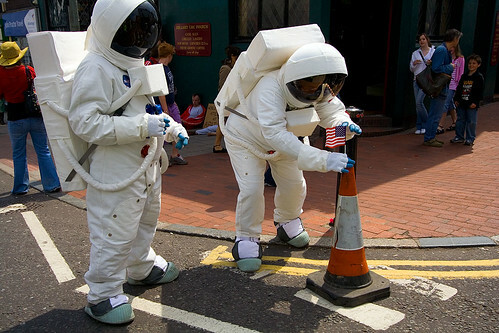 Additional information about the position can be found at www.nasajobs.nasa.gov/astronauts. Apart from the 2/124 chance of dying in a horrible fireball, having to deal with NASA’s rigid bureaucracy of “PowerPoint Pioneers,” and living (while planet-bound) in Houston, the main drawback of the position seems to be that would-be astronauts must apply through NASA’s byzantine STARS (“Staffing and Recruitment System”) system. Like every government agency job site I’ve ever seen, STARS requires tedious resume recreation in order to produce a rigidly-simplistic-but-standardized document in Courier font that looks like something from the typewriter era (though no job site could possibly be as user-unfriendly as FCCJobs). If Obama really wants to attract talent into the civil service, why not let people apply with a simple link to their LinkedIn profile or some such thing?